Geordi La Forge is heading to a vacation and seminar when his shuttle is intercepted by Romulans and he is captured. They brainwash him and program him to perform whatever tasks they want. Meanwhile, a Klingon planet is experiencing a rebellion and it is suspected that the Federation is aiding the rebels. The Enterprise is dispatched with a Klingon ambassador to investigate. Much evidence points to the Federation being involved, and Geordi’s mind control also leads him to send more evidence, but the timeline is forced forward as the non-brain-controlled Geordi and crew push the investigation. Geordi is ordered to kill the Klingon governor, but some quick thinking by Data saves the day. 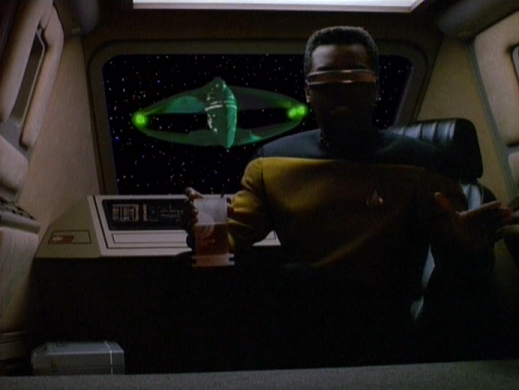 I was blown away by this episode from the great opening getting to see Geordi at leisure and then getting kidnapped all the way through the great ending. There are two primary things that make this a superb episode (namely, a Geordi-centric episode that uses the strength of his character and a very strong main plot), but it also gets all the details right. Those details include the ongoing investigation Data is doing into the strange emissions which makes his detective work at the end of the episode out to be part of that rather than a kind of deus ex machina ending, great use of secondary characters, continuity with the broader plot happening throughout the conflict with the Romulans, and good music. The plot itself is excellent, as it both ties in with the storyline of the Romulan-Klingon-Federation timeline and helps expose the notion that the Federation-Klingon alliance is not exactly airtight. There is real tension here as viewers wonder whether another step towards alienation between the two governments might be taken. The focus on Geordi is a smart move as his character is quite lovable but also rarely gets treatment apart from a string of failed love interests. I also need to comment on the ending. This is how you end an episode! The closing scene opens with a close-up of Geordi adamantly arguing with Deanna Troi: “But I remember!” as he points to his head. After he describes some of his memories, Troi takes him back to the shuttle and leads him into it by saying “The first thing you did when you saw the Romulan ship was…” [I paraphrased here] and he just completes the sentence, then realizes this conflicts with his other “memories.” It’s a revelatory moment for him and one which just ties the episode off with just enough closure and ambiguity to get viewers’ minds racing. It is also a great moment for Troi, as she demonstrates her capacity as counselor in the most convincing way yet. “The Mind’s Eye” is just a phenomenal episode and one that deserves a place among the all-time greats. The Enterprise explores a Nebula which leads to some strange occurrences with dark matter. Meanwhile, Data and another officer, Jenna D’Sora enter into a relationship after D’Sora comes to realize that Data is “perfect” due to his thoughtfulness and kindness (and Data’s questioning the crew about whether it might be a good idea). As the strange occurrences increase, the Enterprise is caught in a struggle to escape–led out of the Nebula by Picard in a shuttle. D’Sora ultimately realizes that Data’s lack of emotions is a greater rift to cross than she realized. They break up, but the ship is safe. Here’s a strong episode that doesn’t quite do enough. The main plot about the Nebula is mostly a backdrop for the drama between Data and D’Sora. It’s a nice touch to have the two of them working on the Nebula so that it doesn’t seem totally like two episodes thrown together, but the relationship is the star of the episode. Data’s interactions with D’Sora are suitably hilarious, with his comments ranging from unintentionally insightful to blatant howlers. It’s a great way to explore Data’s character on the level of human relationships, even if it is just a bit hard to believe that D’Sora would think such a relationship could work. My wife and I both laughed quite a bit in this one, and it is a pretty fun episode. The best part about the episode, though, is the ending, which turns the episode on its head from being a kind of lighthearted romp into a serious look at Data’s continued struggles. Data’s response to the breakup is just to query whether the relationship is over and then say that he will delete the relevant file. After D’Sora leaves, Data holds spot and calmly pets him while he blows out the candle. It’s a totally bleak ending that shows just how much work Data has to do yet to realize his goal of becoming “human” in a more relevant sense. His lack of emotions means that on a fundamental level he cannot connect to (or even genuinely care about) humans, and–in an almost dark twist–doesn’t even register the problem that this is. Fun side note: this was apparently the first episode directed by Patrick Stewart (Picard). Anytime I read the phrase “it’s the next Hunger Games” I get excited. When that is combined with comparisons to Orson Scott Card’s phenomenal Ender’s Game (my look at the book here), it’s time to read that baby! Pierce Brown’s Red Rising fulfilled both of these criteria, so I rushed to get it from the library (well, I had to wait about two weeks, but you get the idea). What did I think? Read on! There are minor SPOILERS below. Brown has done an excellent job world-building. The Society dominates the known universe and different castes are maintained through a Color system. The eponymous Reds–of which Darrow, the main character, is one–live on Mars and terraform the planet in brutal conditions. They don’t even know the extent of their plight, as the book later reveals whole layers of reality beyond the narrow confines of the beginning. Violence often seems offhand, but Brown writes it in such a way as to speak to the beauty of human activity and love even in times of great sorrow and stress. He has a way of capturing emotions in just a few sentences that is fantastic. The book packs a heavy punch in the emotional category. The story also feels like the start of something epic. The injustice in the system must be taken down! The way Red Rising sets the table for later books is great, and the story is extremely compelling. The book is definitely a page-turner. All of this is not to say there aren’t any negatives. First, the fact that this book does draw so many comparisons to the aforementioned Hunger Games and Ender’s Game means that readers will compare themselves, and Red Rising doesn’t quite reach the heights of these other books. That’s not an awful thing–Ender’s Game did win the Hugo and Nebula awards after all!–but it does set up a bit higher expectations than the book reaches. In particular, the book flows quite a bit like Hunger Games. Darrow exists in a world dominated by a hierarchy and he is on one of the lowest rungs. Whenever resistance raises up, it is violently suppressed. He ends up inside a created world for a game that determines peoples’ places in society. There are many comparisons to be made, and this makes the book feel derivative at times. The “game” portion of the book also seems at least 50 pages too long, as we read about raids, violence, and more in a seemingly endless cycle. The world which is so promising never quite gives readers the access to it they desire, but this is the first in a trilogy so hopefully we get to explore more later. Also, the crude language and violence seems a bit over-the-top for something deemed “Young Adult” and although the latter is often integral to the plot, they both seem unnecessarily ubiquitous at points. This book is really a good read. It could have been shorter, and it has a few other pitfalls, but it is quite compelling. I look forward to reading the next one. 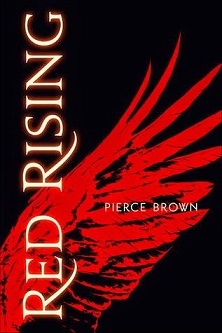 Pierce Brown’s Red Rising has much potential and several unique aspects, but doesn’t quite rise to the same level as its inspirations. Red Rising: You Must Live for More– A look at the worldview issues behind the book from Anthony Weber. I highly recommend you follow his fantastic blog! I have embarked on a quest to read through the Star Wars Expanded Universe once more. Be sure to check the linked text there to see other posts in this series. Here, I look at The Last Command by Timothy Zahn. Does the conclusion of the Thrawn Trilogy live up to the opening works’ potential? I’d say it certainly does. As the Empire’s forces continue to push back those of the New Republic–both through the activity of Crazed “Jedi” C’Baoth and the strategy of Thrawn–Luke and others work to keep politics from overthrowing the republic they’re building up. The action is effectively constant, and Zahn does a great job interweaving plot into what is effectively an almost 500-page action novel. What Zahn continues to do masterfully is portray characters aside from the “Big 3” (Leia, Han, and Luke) in realistic ways. Karrde and Mara Jade are fully realized characters, and Thrawn himself once more appears to be just as much the strategic mastermind as we have been told to expect. One area the book really excels in is this latter thing–conveying strategy during battle. The former two books do have some interesting battles, but Thrawn’s blockade of Coruscant with asteroids seems particularly devious, and his use of cloaked cruisers to make it seem like he can shoot through planetary shields was also delightfully tricky. The ending is perhaps the biggest pitfall of the book. Yes, it does wrap up quite a bit and also–as is typical in the Star Wars EU–opens up a horde of new possibilities for later stories, but it feels incredibly rushed. The last 10 pages happen all at once in a flurry of plot-wrapping that is not disappointing but still feels as though it could have gone on for about three times as long. As with the previous books–but not so pointed as in Dark Force Rising–some events seem to occur in all-too-convenient ways. Characters show up at just the right (or wrong) times and places to push the plot forward, and this sometimes pushes the boundaries of suspension of disbelief. 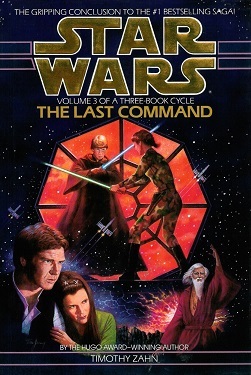 All that said, however, The Last Command is an epic ending to a fantastic trilogy which really pushed the Expanded Universe into existence. These books are revered as much for nostalgia as they are for being great, but it is their strong readability and the way Zahn masterfully brings forth realistic characters that make them endure. R2-D2 attempting to travel through the forest on Wayland. A good reminder that the Prequel Trilogy with R2-D2’s Iron Man upgrades, crazy Yoda, and Jar Jar don’t exist. When trying to think of the grade for this book, I tried to best take into account its place both in my heart and in the broader scheme of the Star Wars universe. There’s no way to avoid one’s own nostalgia, but I also think the book, like the rest of the trilogy, represents one of the better entries of the Star Wars universe. So far, my journey through the EU has been great, with very little to disappoint. We’ll see if that continues as I move on! I embarked on a quest to watch through Tor’s list of 80s Fantasy. I haven’t seen many of those flicks, so I figured I’d watch through. Here, I review “The Dark Crystal.” There will be SPOILERS in what follows. There was quite a bit of parallelism in the narrative beginning, which was really interesting. Unfortunately this parallelism didn’t really continue in the rest of the movie. Nor did the plot really get any more depth added beyond the beginning. The story is pretty straightforward: go restore the Dark Crystal so that the world can go back to being green and happy again. So the setup is what you have to rely on to keep the whole rest of the narrative going. But let’s be honest. “The Dark Crystal” is not at all about the plot. It’s about a whimsical, beautiful journey. And beautiful is probably the defining characteristic of this film. Every single set is a veritable feast for the eyes as details abound. Small creatures move around; water bubbles; plants move and have unique looks to them; everything is covered with intricacy. It’s pretty amazing to behold and it is easy to just get caught up looking at the movie rather than watching it. Scene after scene shows viewers yet another marvelous vista, another amazing place that looks worthy of exploration. And while we’re listing some good things, that opening scene was pretty awesome, wasn’t it? The voiced-over opening with the parallels between the bad guys and good guys. The beautiful scenery. The foreboding castle. That is fantasy done right. It is, however, kind of hard to get over everything being a puppet. Sure, I love Star Wars and there are puppets in there all over. But they are used more subtly. EVERYTHING in this movie is a puppet. Seriously. If it moves, I’m pretty sure it’s a puppet. That’s not a bad thing by necessity, and they are just as beautifully and interestingly made as are the sets, but it is a little hard to get over it. 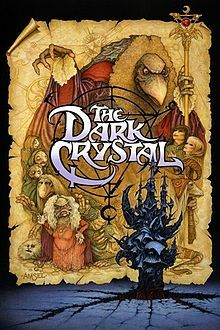 “The Dark Crystal” is the kind of movie I am confident I would have loved if I had seen it about 20 years ago. Unfortunately, I’m first seeing it now, and some of the flaws that I think nostalgia or youth could have covered are all the more evident because of this. The movie is stunningly beautiful, but the plot itself is extremely thin. That said, it is such a feast for the eyes and the setup is so good that I feel willing to forgive a whole lot. Also, I really wish I’d seen it a while back because I’m pretty sure this would have been among my favorite movies ever. The Enterprise is to help the people of Kaelon II try to rejuvenate their sun and so continue surviving. Dr. Timicin, a leading scientist from the reclusive people, comes aboard. As he conducts experiments, Lwaxana Troi, aboard for other reasons, quickly falls for him (and he for her). However, after the experiment ultimately fails, Dr. Timicin is recalled. It turns out he is to die, because he has reached the traditional age at which the people of Kaelon II euthanize the eldest generation. After seeking asylum, Dr. Timicin is ultimately convinced by his daughter (and others) to return home, despite not having finished his life’s work. Lwaxana Troi disagrees with the custom but utlimately returns with him. The first line of this episode is from Deanna Troi and ends with: “My mother is on board.” It is at this point I knew this episode would probaby be super hard to watch. But honestly, the shortcomings (i.e. the continued existence of Lwaxana Troi) are in part overcome by the episode itself. The problem is that this is the kind of story which the writers apparently think is the only possible one for Lwaxana Troi–a parade of failed love interests. I caught myself thinking: Oh look, Lwaxana Troi throws herself at another man and something causes an epic failure in the relationship. Yeah, big surprise right? It’s unfortunate because if the previous episodes with the elder Troi had been able to establish any kind of decent rapport with her character as opposed to being utter drivel, it would be easier to sympathize with her and perhaps overlook the rehash of her story. The main plot, however, is intriguing enough to cover some of the sins of the character. Indeed, Troi looks downright gracious when she finally gives in and goes down to the planet alongside her latest love interest in an act of solidarity. The episode really ends up being an intriguing look at the topic of euthanasia and the ethical quagmire that can be brought up around it. Dr. Timicin is a decent guest character with a pretty solid backstory and enough rapport with viewers to make us care what happens to him. And heck, making Lwaxana Troi somewhat more likeable is an epic feat on its own. Not a great episode, but amazingly not terrible. The best moment: Picard trying to slowly worm his way around to avoid Lwaxana at the beginning of the episode, only to be caught. Hilarious! An ambassador the Enterprise is shuttling around, Odan, has hit it off with Dr. Crusher. However, when a militant faction causes an injury, it turns out that the body that Crusher had known was merely the host for a parasite that was the real intellect behind the man. They implant the Trill parasite in Riker for the negotiations, which leads to much akwardness as Riker’s body is guided by Odan’s mind and still loves Crusher. The negotiations succeed, and Odan gets a new host–a woman! Crusher can’t handle the craziness of changing bodies and the two depart on friendly terms. It seems we again tread familiar ground with a female character. Haven’t we seen Beverly Crusher get swept away by some random guy before? Well kind of. But parts of this episode seem to also mirror Deanna Troi in episodes like “The Price.” Here, it is Troi giving Crusher knowing looks and random insights about being in love. It’s almost like it’s the same dialogue/scenes just with the characters reversed. Very strange. Speaking of strange, there are just too many plot holes here to take the premise itself as seriously as it needs to be taken. Where do the Trill get hosts? What of the host bodies? 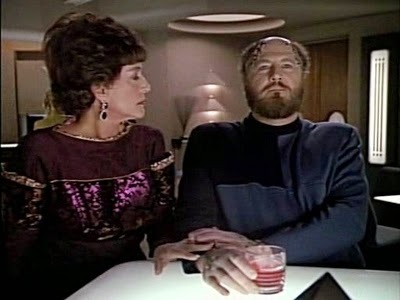 Did no one really consider the possible damaage to Riker? Who became first officer? What would have happened if the Trill took sensitive Starfleet data from Riker’s mind? The questions multiple interminably. Granted, this is science fiction–and Star Trek at that–so the suspension of disbelief is expected. However, that suspension can only be pushed so far. Moreover, I wish that we could get more episodes that made better use of Crusher (like “Remember Me”). I get it, she’s a female doctor, so she apparently must have a love interest for her. But really? Do we? Pulaski got some episodes where she got to be an epic doctor as a doctor (like “Unnatural Selection“) so why can’t Crusher? And to make it worse, we know TNG can do it because it has done it before. I expect better, but maybe that’s a testament to how good season 4 has been. I recently ran across a post on Tor’s blog entitled “A Ranking of 1980s Fantasy that would Please Crom Himself!” I read through it because I love fantasy, but then I realized how disturbingly few of these movies I have actually seen. In fact, the only ones I had seen were #1 “The Neverending Story” and #2 “The Princess Bride.” These movies are amazing, and I figured I’d watch the others. So, here we go! I’ll be writing a brief snippet/overview of each flick, then going through “The Good” and “The Bad” aspects of the movie. After that, there will be a grade from A+ through F. I’m hoping to pick up some awesome viewing along the way. And hey, if I don’t, I suspect a bunch of 80s movies will be hilariously weird enough to at least be entertaining. I will update this post with links to the reviews as I watch the movies. I expect this will take me a long time to get through, but I have already watched one of those I haven’t seen yet, so buckle your seatbelts because we’re going to embark on an epic adventure of hair and magic as we go through some 80s Fantasy flicks together. The Dark Crystal Review– Fantasy Muppets LOTR. How does it fare? Labyrinth Review– David Bowie as a fantasy movie star? Where do I sign up? Or maybe I need to sign out? Willow Review– How does Lucasfilm’s try at an epic fantasy work out? Check out the review to find out. Ladyhawke Review– I immediately bought this one. Why? Read on to find out! The Black Cauldron– Many people’s childhood favorite. I’d never seen it before. Does it hold up to a viewing from a 28-year-old? Clash of the Titans– How does this retelling of Greek mythology play out? Wait, is that Maggie Smith? What!? Highlander– We all know “there can only be one,” but is this one worth watching? Excalibur– You better dust off your copies of King Arthur lore before watching this one. Seriously. The Last Unicorn– An annoyingly catchy theme song basically tells you the plot of this one. But can a truly vile enemy make the movie great? Conan the Barbarian– Arnold as fantasy warrior. What could be better? Dragonslayer– Dragons must be slain. Does this movie do this fantasy trope justice? The Neverending Story– I loved this movie as a kid. How does it hold up after so many years? Conan the Destroyer– Will the second iteration of Conan be worthy of the first? The Beastmaster– Do you enjoy a heaping helping of animal abuse with your film? No? Don’t watch this one. Here’s the list provided by Tor. If you have any comments on any of the movies (PLEASE BE SPOILER FREE), feel free to drop your thoughts/recommendations. Picard is hosting a major archaeological conference on board the Enterprise and Vash–the woman from “Captain’s Holiday“–shows up. Q also peeks in. Q wants to do Picard a favor, because he feels he owes him after being reinstated into the Continuum. 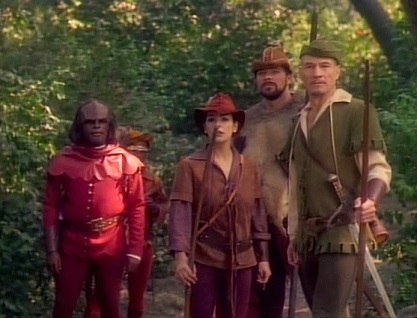 He sees the struggle Vash and Picard have hitting it off again and thrusts them into a Robin Hood scenario placing Picard as Robin Hood and Vash as Maid Marian. Picard saves the day after some difficulties, and Q whisks Vash away to explore more of the universe. “Q wants to do Picard a favor.” Yep. This should be good. And it is! A reprisal of Vash as Picard’s love interest is just perfect, and to have Q try to set them up via making Picard Robin Hood? Genius. Really, this is just an absolutely delightful episode. The Robin Hood aspects of it are just hilarious and clearly a play off the grand Errol Flynn film. This could have gone so poorly but it was pulled off with just enough of a combination of seriousness and tongue-in-cheek winking that it just works. Having the scenario play out in unexpected ways like Vash capturing Picard –and throwing Q off balance–is one of the thigns that makes the episode so good. “I PROTEST! I AM NOT A MERRY MAN!” – Worf. Yep, that kind of dialogue is so hilarious and it what makes this episode really click. They perfectly chose which characters would be which and then executed a fun plot to go along with it. Finally, the touch of reiterating Picard’s interest in archaeology helped maintain his characterization on the show. “Qpid” is so fun. It’s the kind of episode that the Original Series almost always aimed for. TNG occasionally does it but generally maintains a more serious tone. Here, the silliness worked perfectly. A Klingon is caught sending information to the Romulans but a simultaneous explosion leads to a witch hunt aboard the Enterprise as a conspiracy is suspected. Even Picard is brought before the tribunal, but it is ultimately revealed as exactly what it is: a witch hunt with little basis in reality. The episode is built upon an interesting premise: the notion that people will always have some built in conspiracy-mindedness that can bubble over into false accusations and absurdity. The problem is that the episode is built entirely upon that premise. There’s really nothing else here. Picard gets some great dialogue about the travesty that is occurring, but even that ultimately gets dragged out too long and becomes entirely preachy to stay entertaining. Another difficulty is that once Picard himself is put to the question, we as viewers know the stakes have been dissolved–they’re not going to remove Picard from the series, so we know we’re in for exactly what we get: Picard lecturing the silly people who have launched the witch hunt. When it was just the random medical officer, we were concerned with whether he would be unfairly found guilty, but with Picard it becomes predictable. I’m one who enjoys Picard’s lectures, because they are often quite moving, but here the predictability of it and the centering of the whole episode around it was just at little too much. It’s not a terrible episode, but it needed much more to be great.